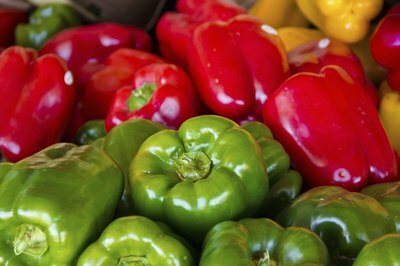 What Is the Difference Between Green, Red, Yellow & Orange Bell Peppers? All colors of bell pepper cultivars are found in a single annual species, Capsicum annuum. Red, yellow and orange cultivars contain more beta carotene than green varieties, and the air temperature while they're growing in late spring and early summer may affect their ability to achieve their final color at maturity. No differences exist in cultivating them or in their culinary properties. Home gardeners typically plant pepper seedlings from nurseries because their seeds germinate slowly and only when the soil temperature reaches 80 to 85 degrees Fahrenheit. If you germinate seeds yourself, plant them indoors seven to eight weeks before soil warms in the garden. Transplant seedlings no more than 10 weeks old when daytime temperatures are between 65 and 70 F.
Bell peppers plants of all colors grow best when night-time temperatures are between 60 to 70 F and day-time temperatures are between 70 to 85 F. They will drop their blossoms if they set excessive peppers, daytime temperatures are above 95 F, or night-time temperatures are above 75 F.
Bell peppers all start green. Green peppers remain green. Red, yellow and orange peppers go through a progression of colors before they achieve their final color at maturity. Because growers have to leave bell peppers on the vine longer to turn red yellow or orange, they charge more for them at the market. Bell peppers should be ready to pick about 70 to 85 days after you transplant a nursery seedling or from 100 to 120 days after you plant seed. The temperature while peppers mature may affect the ability of red, yellow or orange cultivars to achieve their final color. Green peppers have more chlorophyll while orange peppers have more alpha, beta and gamma-carotene. Red peppers contain more of the carotinoids astaxathin and lycopene. Yellow peppers have more of the carotinoids lutein and zeaxanthin. Red peppers, from which both pimento and paprika are prepared, contain 1 1/2 times more vitamin C and nearly 11 times more beta-carotene than green peppers. Beta carotene and other carotinoids found in orange, yellow and red bell peppers are good for your health. Studies conducted by the National Institutes of Health suggest carotinoids may help decrease the incidence of eye disease and certain cancers. Red, yellow and orange cultivars also contain significantly more vitamin C than green cultivars. You can pick green bell peppers any time. If you pick them before they are fully ripe, their natural sugars will not have a chance to develop so they will not be as sweet as orange, yellow or red peppers that only achieve their color at maturity. All green peppers will eventually turn red, but they're best picked while they're still green. If you wait until they turn red, they will not be as firm and smooth-skinned. These red peppers are not the same as cultivars developed to turn red while they are still firm. California Wonder (_Capsicum annuum_ "California Wonder"), an heirloom plant native to North America that was the green bell pepper standard for decades. North Star (_Capsicum annuum_ "North Star"), which takes only 60 to 65 days to mature. Big Bertha (_Capsicum annuum_ "Big Bertha"), a thick-walled green pepper that matures in 70 to 73 days. Red beauty (_Capsicum annuum_ “Red Beauty”), which produces large fruit. Mini-red (_Capsicum annuum_ “Mini-Red”), an heirloom miniature that yields 2-inch-wide sweet red peppers. Large Sweet Goliath (_Capsicum annuum_ “Sweet Goliah”) peppers, which are 7 inches long and 4 inches wide and turn from green to dark red as they ripen. Wisconsin Lakes (_Capsicum annuum_ “Wisconsin Lakes”), a sweet pepper that turns red early in the growing season. Canary (_Capsicum annuum_ “Canary”) peppers, which turn from green to bright yellow at maturity. The flavorful Giallo di cuneo (_Capsicum annuum_ “Giallo di cuneo”), a large, square pepper with thick walls and thin skin. Mini yellow (_Capsicum annuum_ “Mini-Yellow”), which grows sweet peppers 2 inches wide. Coral orange (_Capsicum annuum_ “Coral”), which changes from green to bright orange as it ripens. Garden sunshine (_Capsicum annuum_ “Garden Sunshine”), a 12- to 16-inch plant that produces peppers that change to orange. A sweet pepper, orange sun (_Capsicum annuum_ “Orange Sun”), which yields slightly tapered, bright orange peppers. Gourmet (_Capsicum annuum_ “Gourmet”*), the sweetest orange pepper that typically yields six to 12 peppers per plant. Whfoods: Green Yellow and Red bell Peppers - What's the Difference?